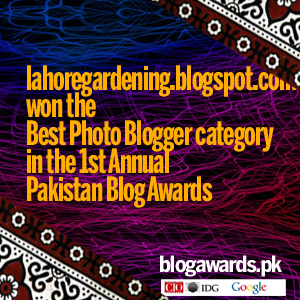 It is 15th again and here is the post for my garden bloggers bloom day. GBBD is a monthly event hosted by Carol at her website May Dreams Gardens where gardeners from all over the world post the pictures of flowers blooming in their garden on 15th of every month. Do visit her website for more interesting flowers. 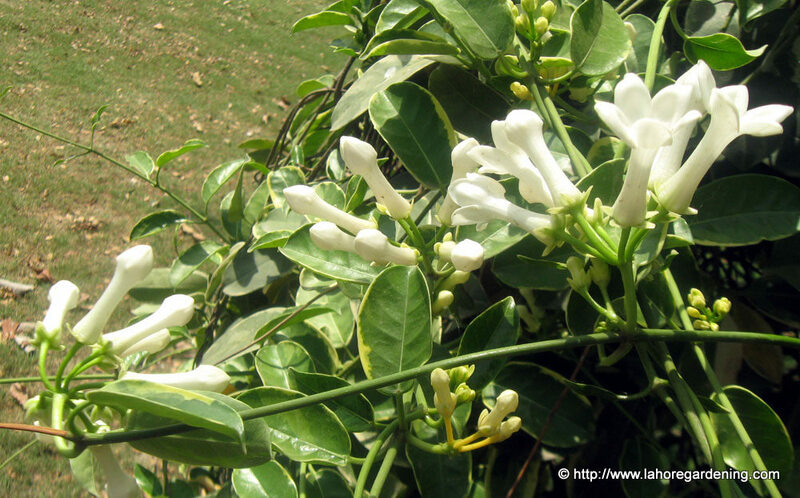 Let me show you the flowers of Fried egg tree, sandpaper vine, plumbago and stephanotis in bloom. This daylily was gifted to me by a gardener and he himself was not sure of the cultivar. Very pretty blooms. Much different than the common orange day lily. This one is most elegant trees of lahore for sure. It is called gul-e-neelam or neelam here. Botanical name is jacaranda mimosifolia. There is another variant of jacaranda, more blue jacaranda but not pictured yet. This is brachychiton diversifolius there is no local name. There are many trees in india and pakistan of genus brachychiton. 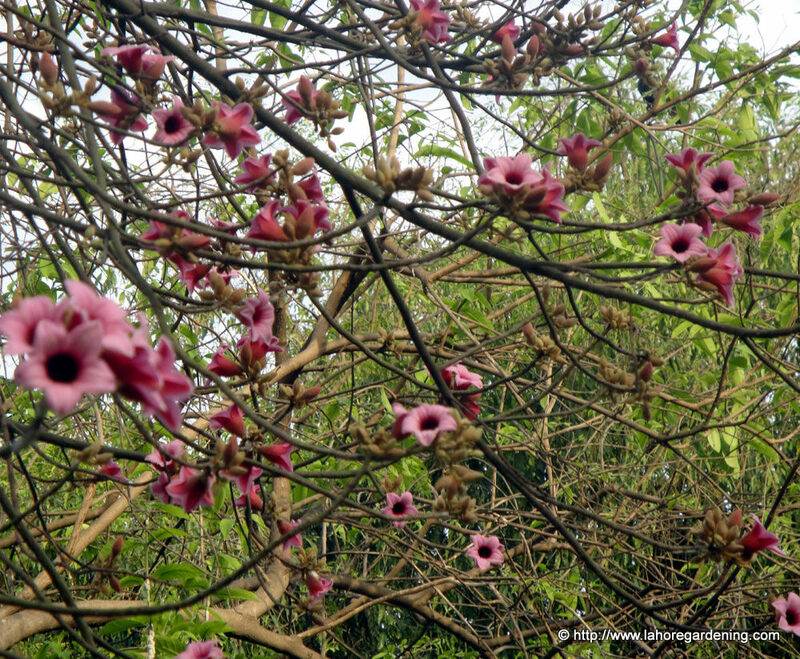 The one native of australia brachychiton australis is found in India as well. 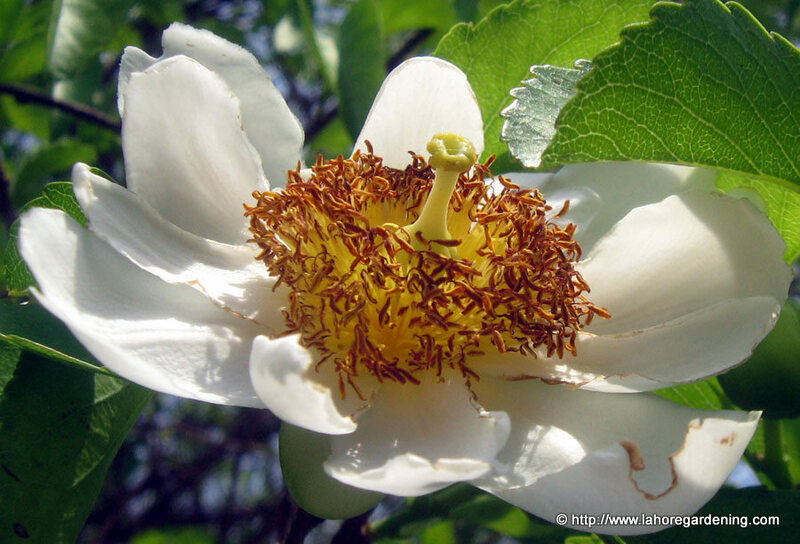 There are no leaves or almost none when in bloom and tree is covered with flowers. This one is another gem for warm climates. 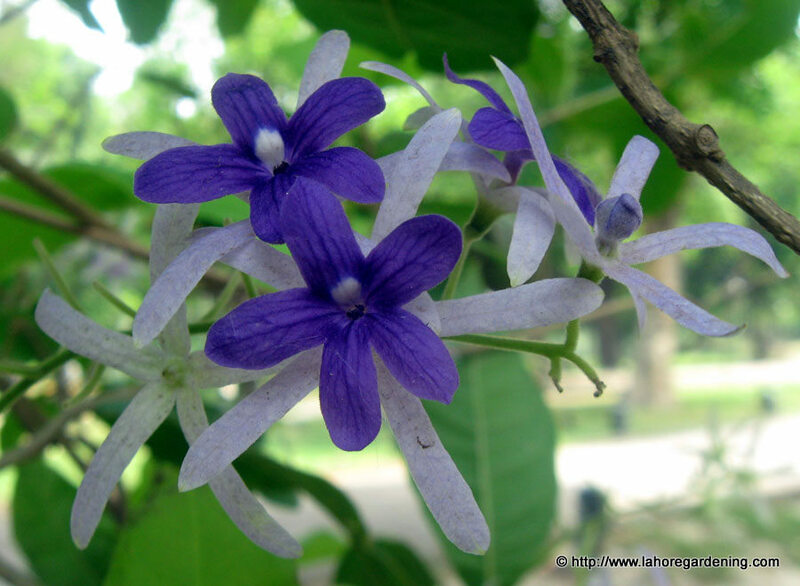 Purple Wreath Petrea Volubilis also known as sandpaper vine. You will find flowers of many colors on the vine at the same time. They are blue, then white, and yellowish white as well. Some what shrubby in nature. Talking of shrubs, this one is a stunning shrub for warm climates. Hailing from South Africa, it is Plumbago capensis There is another variant with white colors but this one is more stunning. Flowers profusely whole summer if protected from afternoon sun. 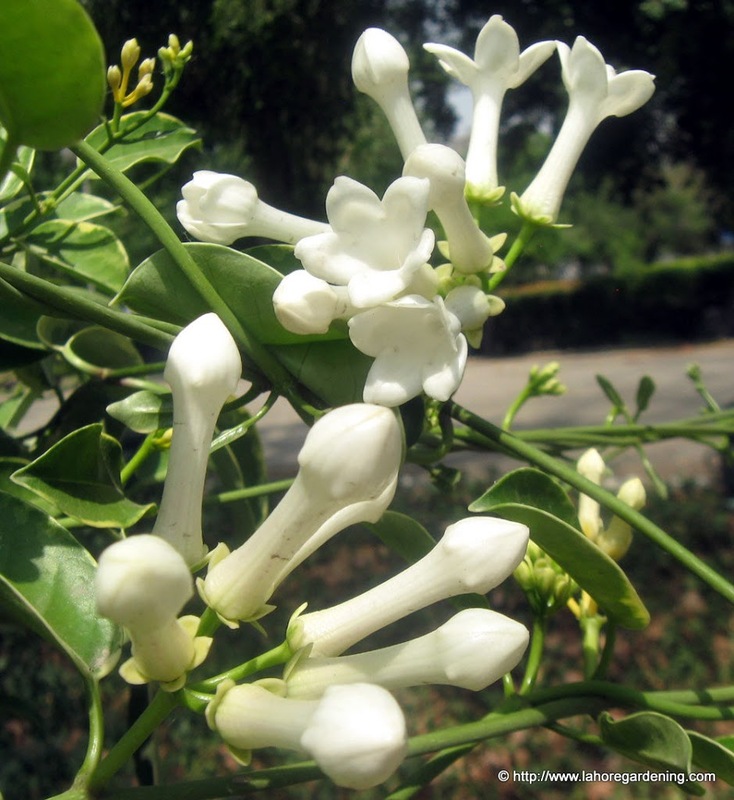 If there is one vine i wanted the flowers so badly, that was Stephanotis floribunda also known as Madagascar Jasmine, this one need lots of humidity and warm climate and here is the point, it dislikes extremely hot areas. 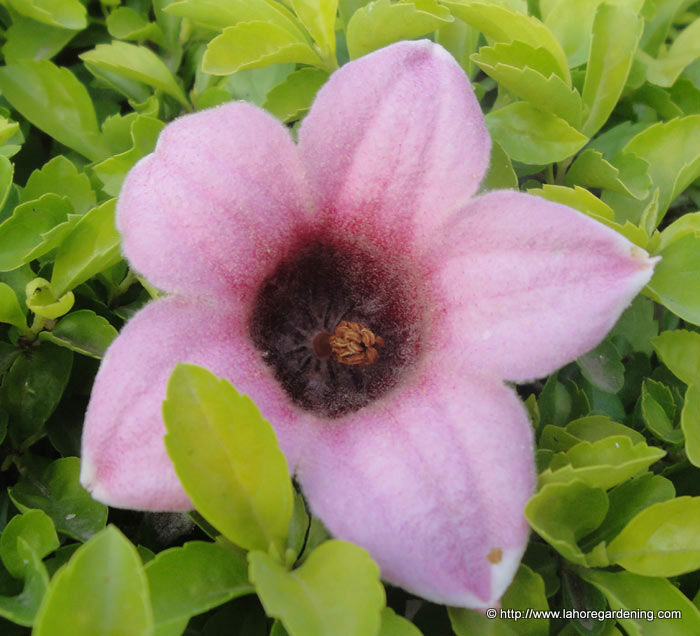 True, it flowers late when mature but it is not a free flowering easy veasy vine. 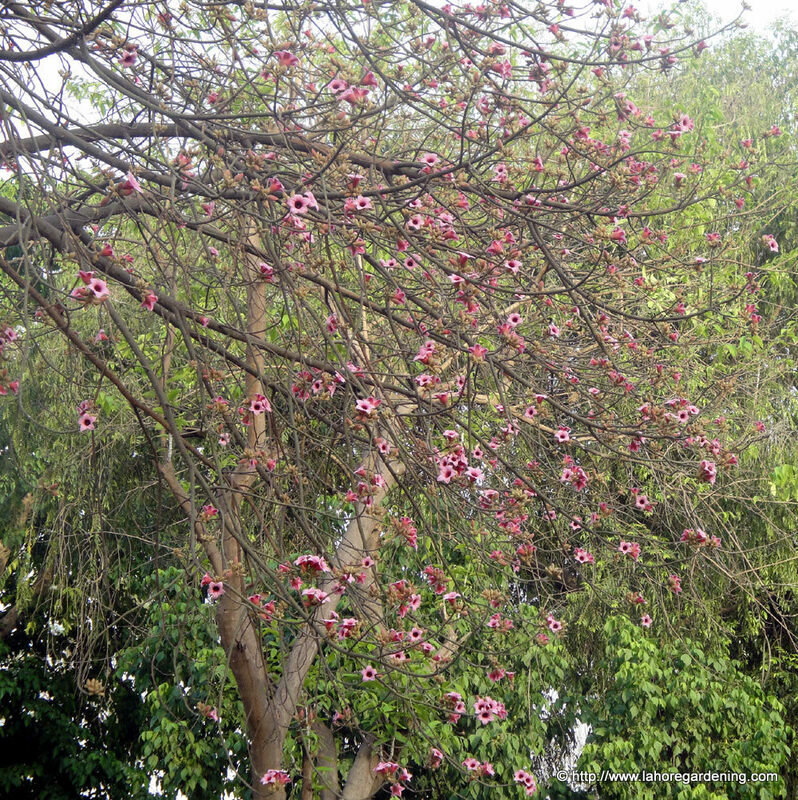 These flowers were shot in Lawrence gardens lahore and note that this is a very old and mature specimen. The fragrance is worth dying for sure. This post is also included in Today’s Flowers. So don’t forget to visit for some exciting flowers blooming all around the world. You’ve shared a great collection of tropical beauties this post. Jacaranda is my all-time favourite tree … it really is a stunning sight when the tree is in full bloom. 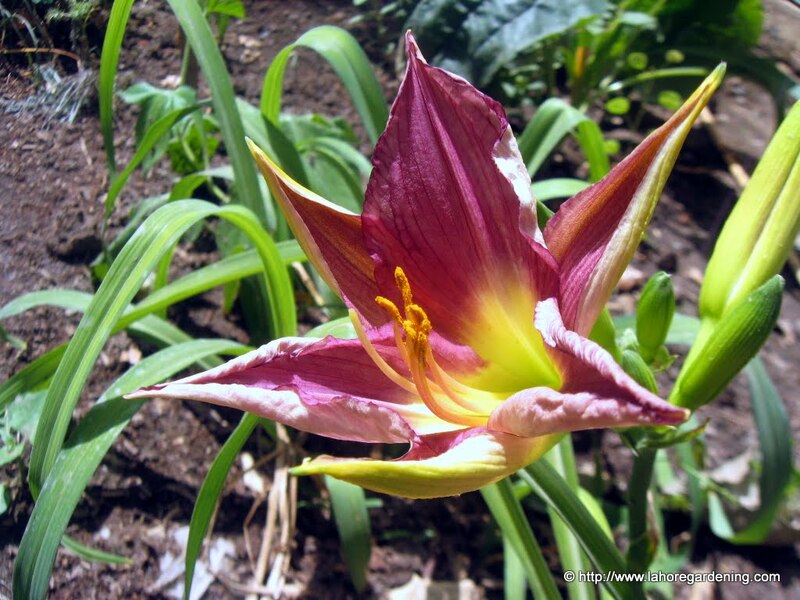 Love your new Daylily too! I’m guessing your climate and ours is very similar just the seasons are opposite. Jacaranda are very popular her but flower in October. Great picture of the jacaranda! I love the jacaranda mimosifolia – all the photographs are great! great collection of flowers. i especially like the shots of the neelam and jacaranda. Your tropical blooms are so beautiful and unusual. 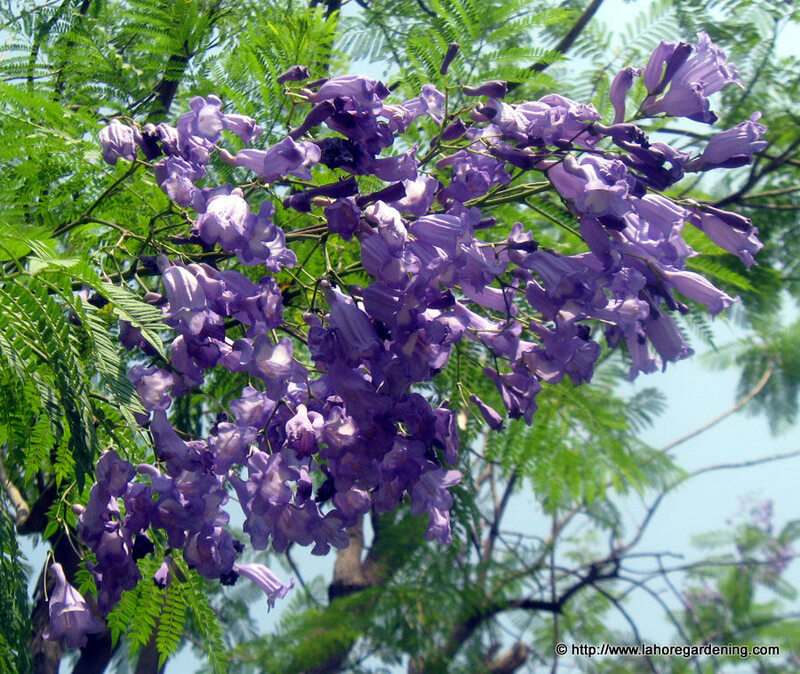 The jacaranda mimosifolia is magnificient. I enjoyed your photos! Happy GBBD! Oh I love the Sandpaper vine flower. Never seen that before. Very pretty. these are beautiful! the sandpaper vine is amazing. That jacaranda is simply stunning. It is so nice to see what is blooming in your neck of the woods…such beautiful flowers. Happy GBBD Day! Great collection of flowers and so informative blog. Beautiful colors and details in these images. 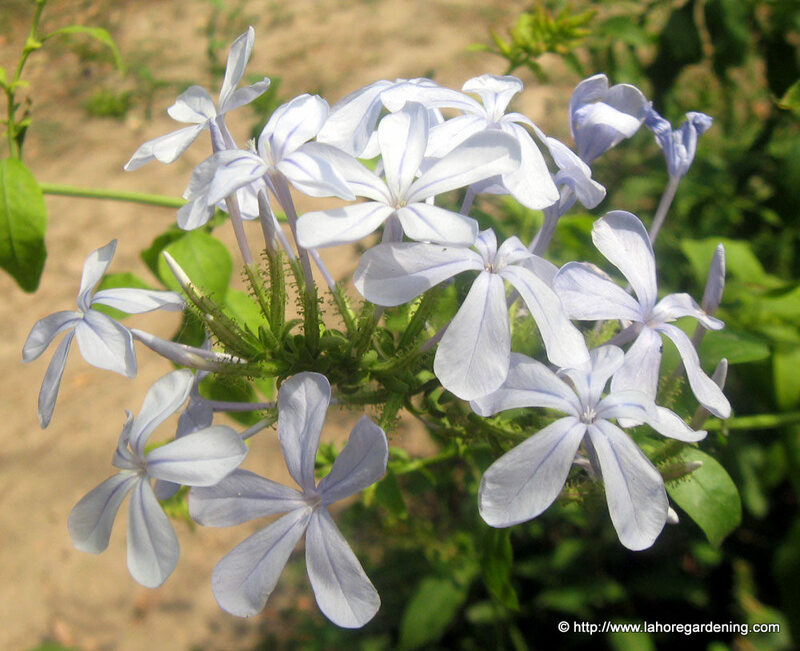 I do have a plumbago in my back yard…but now I want each and every species you’ve shared!! I need a bigger yard. beautiful photo share. Here’s an open invitation to view my ‘legendary’ MERMAID’S PURSE…a sea ‘oddity’. If you have time…come on over for a visit!! Great theme. I love those jumbo jasmine flowers! What an interersting garden party. A great idea and a wonderful way to share what’s blooming. A beautiful garden tour. The jacaranda is stunning. Wonderful series of fantastic flowers! You have great flowering trees and shrubs, so interesting! Wow! These are absolutely wonderful! So beautifully unusual. We don’t have these in temperate PA, USA. WOW! What an interesting garden party. A great idea and a wonderful way to share what’s blooming. I am inspired from your blog, so pretty!! That is a lot of blooms. The variety and color . . . they are gems indeed. I love the color scheme and type plants your using in your garden. The colors are wonderful and the flowering bushes and shrubs are elegant too.